The florescence of the Neolithic was during the PPNB. The experiments with village, and presumably sedentary, life that commenced during the earliest Neolithic, the PPNA, and perhaps even the Natufian, culminated during the PPNB. Not only were large settlements occupied, but numerous smaller sites also constituted the PPNB settlement system. All of these events, from the Late Natufian through the LPPNB, occurred over but a few thou— sand years and brought about monumental and irreversible changes from the relatively simple social structures cf hunters and gatherers to more stratified organizations required for the day—to—day existence f village life. It is likely that simple tribal societies were no longer viable social structures within these communities, as the PPN required more complex organiza— tional structures. This is not to say that the emergence of extremely com— plex social hierarchies developed during the Neolithic. Indeed, many re— searchers believe that these societies still maintained a degree of egalitarian organization (cf. Kuijt 1995, 1996; Moore 1985:61).The point, however, is that previous methods of maintaining social control were no longer ad— equate. New structures were required to cope with the increasingly com— plex life imposed by Neolithic society. In particular, aggregation of large populations would have required the emergence of more elaborate social cohesion and control. As successful as the PPNB was, turbulent changes were looming on the horizon. By the end of the PPNB, severe population resettlements occurred. While the old explanation of abandonment, hiatus, and replacement by "new" peoples bearing ceramics has been largely disregarded, there is no question that major changes were under way. 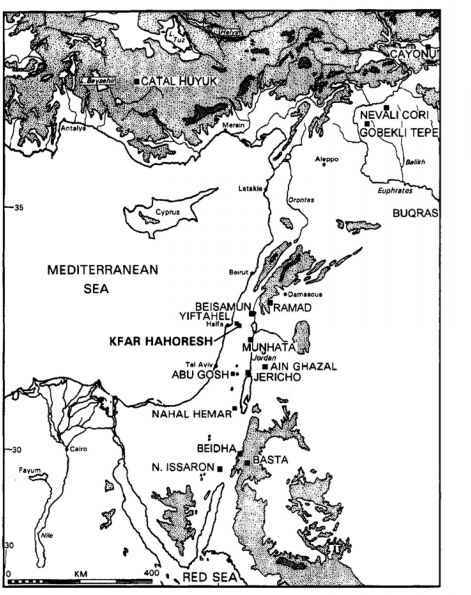 For whatever reasons, be they climatic, ecological overexploitation, or social, the MPPNB and LPPNB witnessed the establishment of major centers in the eastern Levant, such as 'Ain Ghazal, Basta, and Wadi Shu'eib. Many of these were occupied at the time that major western centers were being depopulated. The generally marginal Jordanian Plateau and adjacent areas may not have allowed for the luxury of smaller villages and larger towns spread throughout the region (although a different pattern seems to have existed in southern Jordan). Neolithic communities were faced with a decision: either live in smaller settlements or congregate into larger towns such as 'Ain Ghazal. Either response could have been taken, with perhaps different outcomes. I suggest that the latter occurred, resulting in the development of large, spread out settlements like 'Ain Ghazal. Massive defensive structures would not have been necessary, since previous smaller social groups had by now aggregated into a large unit, thereby lessening the change of intercommunity conflict. Initially, this pattern was adaptive, although it required a modification of existing subsistence and social strategies. For example, throughout 'Ain Ghazal's aceramic development, we see a remarkably wide range of resources being exploited, both domestic and wild; this pattern opposes many of our assumptions of the Neolithic. In point of fact, this strategy was a reflection of a more efficient economic organization in which it was necessary to exploit as wide an array of resources as possible in order to feed a large population located in or near a marginal environment. With these dramatic population and subsistence fluctuations, it is certain that social organization also had to be reoriented. How were these large villages managed? Was there an overall central authority, or were portions of each settlement run by family or clan units, with central authority minimized or only necessary for certain activities? These issues, of course, are difficult to document archaeologically, but there seems little question that a relatively efficient organizational structure with some degree of centralized authority must have been in place to have allowed the prosperity and growth of settlements that probably contained several thousands residents. While difficult to directly assess, there is an array of archaeological evidence that indicates the existence of a more complex social interactive system. Architecture has long been used as a marker of social hierarchy and complexity in the Neolithic (cf. Banning and Byrd 1989; Byrd 1994). Large "public rooms" occur at many PPNB settlements, even if the elaborate ceremonial structures seen in Anatolia seem absent in the southern Levant. Of interest, however, are a recently reported LPPNB "temple" and other possible cult structures at 'Ain Ghazal (Rollefson et al. 1994:23-24; Rollefson and Kafafi 1996:20-22). Ritual objects are another social indicator. By the PPNB there is ample evidence for cult objects. Female figurines, for example, are often cited as "mother goddesses" (cf. Cauvin 1985) and may reflect changes in traditional gender roles. Another group of cultic objects contains the elaborate statutes of'Ain Ghazal (Tubb and Grissom 1995); these undoubtedly had major social significance, possibly related to clan structures within the larger settlement. While most of these remarkable statues are asexual, a few are clearly female (Figure 12.1) and undoubtedly relate to the changing roles of women in Neolithic society (see Chapters 11 and 12, this volume). Certainly the establishment of permanent villages relying heavily on farming required a shifting of traditional gender roles (cf. Bar-Yosef andMeadows 1995:93).Regardlessof specific interpretations, there seems little doubt that ritual objects functioned as a form cf information exchange, and their abundance in the PPNB suggests a degree of social complexity previously unseen. Another method of examining social structure is through burials. Researchers have long held that"... the deceased are given a set ofrepresen-tations of his or her various social identities or roles when alive so that their status or social position may be given material form after death (e.g.,grave-goods, monuments, place of burial, etc.). . . Consequently the social organization of any society may be reconstructed. . . " (Pearson 1982:99). At PPNB 'Ain Ghazal, as at other contemporary sites, there are burial data supporting status distinctions, although there is little evidence for individual high-status burials. Essentially it appears that "normal" inhabitants were buried in a highly patterned manner, in single interments and in flexed positions with their skulls removed and with few burial goods. At least some others were discarded much more casually; these individuals are found in trash deposits in extended positions with their skulls intact. Children appear to have had little status, as witnessed by scattered remains of adolescents and subadolescents. At sites such as Wadi Shu'ieb,however, there is tantalizing evidence for different mortuary patterns. Although only a tiny portion of the settlement was sampled and the burial population is small, interments consisting of up to four individuals were present in addition to single interments. Both types were subfloor and flexed, with skulls removed. Interestingly, burial goods, in the form of plaster beads and in one case a small plaster statuette, were recovered with some of these interments (Roler 1991).This pattern possibly reflects a different social structure than that observed at 'Ain Ghazal. Overall, though, the patterns at 'Ain Ghazal and Wadi Shu'eib are very similar to other PPNB sites, including Jericho. There appears to have been a wide spread mortuary unity among many PPNB populations, and secondary mortuary practices may have been an important means of increasing community cohesion and limiting social differentiation (Kuijt 1995, 1996, Chapter 6 this volume).